October offers an abundance of everything autumn lovers appreciate, at least in this hemisphere. Nature lovers can’t help but get out and enjoy one of the most crisp and colorful times of year. Did you enjoy your weekend? Around this time of year, I keep an eye out for White-throated Sparrows landing around my home… they were right on time! Corey’s Best Bird of the Weekend was a total surprise while on a family outing to Edgemere Landfill in Queens. The idea was to let Desi check out all of the grasshoppers and crickets that call the old, capped landfill home. 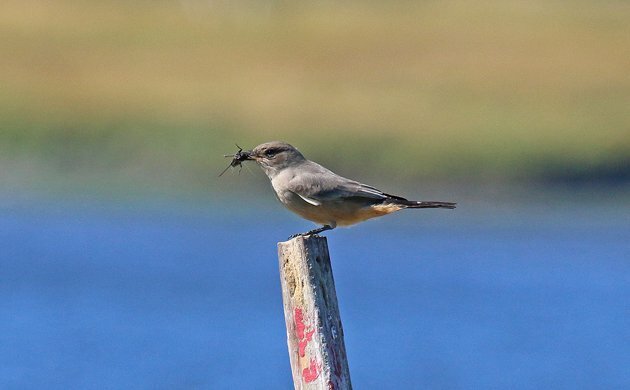 Instead, they ended up watching a Say’s Phoebe enjoying those same insects. A first record for Queens! Well, not a Connecticut Warbler in Germany, but a rather late fly-over Dotterell near Heidelberg was exceptionally nice! All sorts of nice birds in Sagres, Portugal during the birdwatching festival there. My favorite a group of 4 ortolan buntings. I wish I had seen a Dotterel too but I was pretty happy with lowland rainforest birding around Manzanillo, Costa Rica. Good looks at Great Potoo, Purple-throated Fruitcrows, Sulphur-rumped and Rufous-winged Tanagers, and lots of other species. Although my best bird won’t sound exciting to birders from Canada and the USA, it is a very uncommon migrant in Costa Rica and was a country first for me. That bird was a Veery. I ended up seeing 4 or 5 or them. First trip to Hawk Mountain in Pennsylvania was an absolute grand slam. (Check my blog for details.) The highlight was getting my lifer Raven—we saw three! @Pat O’Donnell: Yeah, but did you get to *hear* the Veerys? Best bird(s) of the weekend were two Tawny Owls in Colmberg, Germany – 1 observed and 1 heard. Heard my first Shining-cuckoo of the spring! A deranged Wood Duck. A young female that seems to have been hand-reared and now let go in a wooded valley where there are many wild woodies. She (the deranged one) comes begging for handouts and will happily nuzzle up and clean off any lice, bedbugs or fleas you may have on you. A Philadelphia Vireo and Canada Warbler, both lifers for me! Where Are You Birding This Final Weekend of January 2015?